This information has been kindly supplied by the New Zealand Transport Agency. 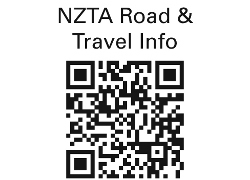 For more information, please visit the New Zealand Transport Agency website. If you enter New Zealand on a Visitor’s Permit and you have a current international driving permit, or a current driver licence issued in a country other than New Zealand. Then you are qualified to drive in New Zealand those vehicles covered by your permit/licence for up to 12 months from the date that you enter New Zealand. Vehicles travelling in opposite directions use most roads in New Zealand and the only thing that separates them from each other is a white line painted down the middle. For this reason it is important that you remember that in New Zealand you must drive on the left-hand side of the road. If you don’t you could be involved in a head-on crash. You must take special care when pulling out onto the roadway after any stop for accommodation, petrol, food purposes etc, as this is when most head-on crashes occur for overseas visitors in New Zealand. When re-entering the traffic flow STOP; think before moving off and give yourself time to adjust. LSZ: This means you can drive at the open road speed of 100km/h. Provided it is safe to do so. However, if conditions are hazardous because weather is bad, visibility is poor, there are people, animals, cyclists or lots of vehicles on road or the road is in poor condition then you must drive at 50km/h. These signs warn you that you are coming up to a curve and recommend a safe and comfortable speed. If you are traveling slower than the speed limit and there are vehicles following you must keep as close to the left of the road as possible – pull over as soon as it is safe to let following vehicles past – never speed up on straight stretches of road to prevent following vehicles from passing you. Important: If you are towing a trailer or another vehicle check often to make sure you are not holding up faster vehicles. Driving when you are tired can be fatal. It is important that when you plan your visit to New Zealand that you are aware that most of our road networks are narrow, winding, and seldom flat or straight. Therefore it is going to take you longer to reach your destination than it may look on a map. Planning tight schedules can lead to tiredness especially when you have just arrived into the country. Give yourself plenty of time and try to stop over at your place of arrival for your first nights rest. Tiredness requires sleep. Get a good night’s sleep before departing on a trip. Never fight fatigue. If you are tired, stop. Take regular breaks - at least once every 2 hours and whenever you get sleepy. If you need to nap, don't set yourself a distant goal, pull over and rest for up to 40 minutes. Use caffeine strategically to increase your alertness. Plan an overnight stay on a long journey. Never drive more than 6-8 hours in one day. Avoid driving, or take extra care driving between midnight and 6am since the human body is most susceptible to fatigue during these hours. Where possible share the driving with a passenger. Eat sensibly, avoiding large meals. Play music or wind down the window to help keep you alert. Don’t drink alcohol at all before driving, or during rest breaks. In New Zealand the law is clear on the use of Safety Belts and Child Restraints in vehicles. The law requires everyone in the car to wear a safety belt, regardless of where they are sitting. All children aged 0-6 must be properly restrained by an approved child restraint when travelling in cars or vans. An adult safety belt is not enough. Must be properly restrained in an approved child restraint. Must use a child restraint if available. If there is no child restraint available, the child must use a safety belt if available. Must use safety belts if available. If there is no safety belt available, the child must be sit in the back seat. The fine for not wearing a safety belt or allowing a person under the age of 15 to travel unrestrained is $150 for each belt not worn. It is the driver's responsibility to ensure anyone under the age of 15 is wearing a safety belt or approved child restraint. People aged 15 and over are responsible for their own fine. Visitors to Southland and Otago will be driving on strange roads and often in a vehicle like a rental car that they are unfamiliar with. Don’t ruin a great holiday by drinking and driving. Alcohol and drugs, including some drugs given by a doctor, can seriously affect your driving. IF YOU DRINK OR TAKE DRUGS DON’T DRIVE. In New Zealand driving while under the influence of alcohol/drugs is a serious offence and if you are caught will lead to Criminal Court action and a penalty – fine or imprisonment. If you're an adult (over 20) the legal blood alcohol limit for driving is no more than 50 milligrams of alcohol for every 100mls of blood. If you are under 20 you shouldn’t drink any alcohol before you drive. Your limit is 30 milligrams for every 100mls. It is difficult to say how many alcoholic drinks you can have before you reach these limits. Because of this the best advice is if you drink at all, DON’T DRIVE.